Jack Vosburgh was a close friend of Ted Annemann and deeply inspired by that master. Annemann referred to Vosburgh as "an unusual idea man." See for yourself in these thirteen novel playing card problems, especially the famous "Future Deck." Everything clearly explained so you can learn them quickly and easily. You have bought another magic 'book'! And a book of card tricks at that! I hope you won't be disappointed. 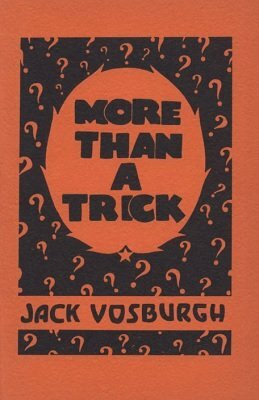 Because you have shown enough interest in card magic to invest in this book you evidently share with me the opinion that there is nothing actually wrong with card tricks as long as they are really mysterious and dramatic, and that it is only the thoughtless misuse of card magic which justifies criticism. That is the yardstick I use in selecting effects for my repertoire. By the grace of a lucky imagination I have developed several novel playing card problems which satisfy this criterion of effect. My material here is the result of several years experimental presentation. The effects are magical, and the methods are easy and subtle. Since all of them have been worth money to me I am publishing them in the hope that they may be worth money to others.